The contemporary designed Saturn ceiling fan from Vaxcel has white or pine coloured blades 52" (132cm) and is finished in satin nickel. This ceiling fan has reversible pine and silver blades, each blade supplied can be flipped over to show the colour of your choice. The Saturn ceiling fan comes with a 3 speed radio frequency remote control. Reversible for summer/winter operation. 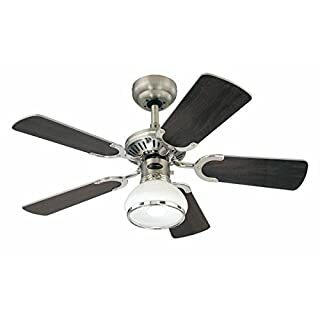 For year-round comfort and maximum energy savings, this Vaxcel AireRyder ceiling fan includes a reversible switch that allows the ceiling fan to be used during cool or warm weather. 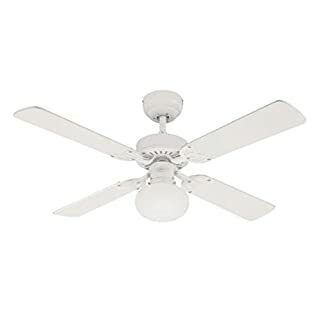 In the summer, keep your home cool by running your ceiling fan counter clockwise. In the winter, run your ceiling fan clockwise to re-circulate warm air from the ceiling, eliminating cold spots and cold drafts. This fitting requires 2 x 40w max E27 (ES, screw cap) light bulbs. Make this fitting lower energy by selecting an energy saving bulb option. 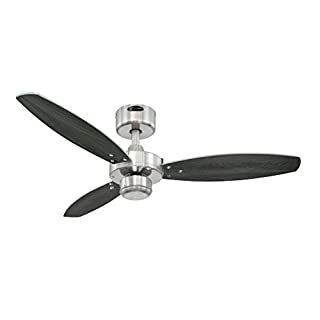 Modern MiniSun branded three speed ceiling fan in a brushed chrome. 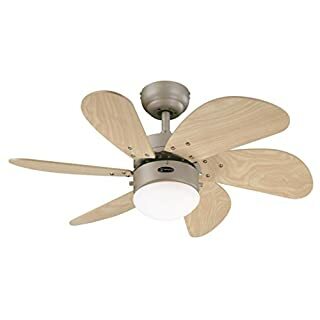 Features six blades in a wood effect finish. Includes an integrated ceiling light with on / off pull switch. 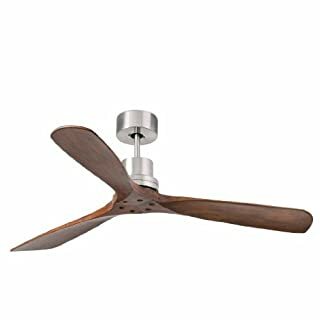 Ideal for most rooms, this superb ceiling fan has a directional motor so it can be used in both warm and cold conditions. 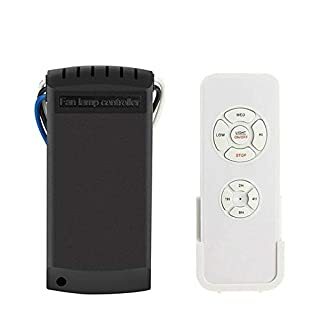 Comes complete with full product guide and installation instructions. RPM on highest setting: 200 RPM on medium setting: 140 RPM on lowest setting: 90. 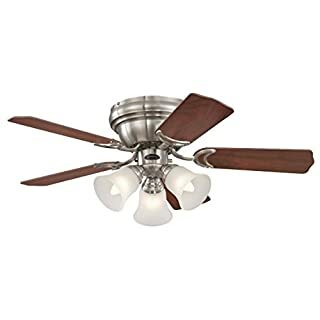 The 42" 105cm Jet I ceiling fan from Westinghouse (72289) has a brushed nickel finish with reversible blades that can be fitted to show either silver or wengue finishes. Each blade supplied can be flipped over to show the colour of your choice. Reversible for summer/winter operation. 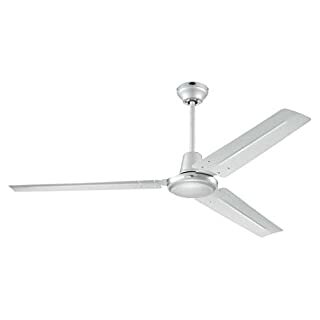 The Industrial ceiling fan from Westinghouse (72501) has silver (steel) blades with a silver fan finish. This fitting includes a wall control. Reversible for summer/winter operation. 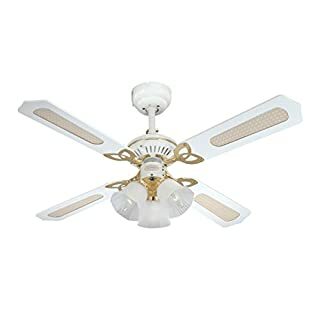 The Princess Radiance II ceiling fan from Westinghouse is inspired by Baroque architecture and furnishings, traditionally designed ceiling fans are characterized by distinctive details, antique accents, and rich colours, which are still popular today. 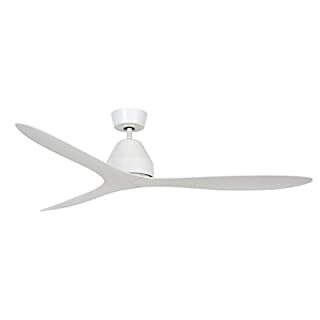 This ceiling fan has reversible wengue and white blades, each blade supplied can be flipped over to show the colour of your choice. The light fixture has a single dome glass shade in a chrome and dark pewter finish and which requires a 1 x 60w max E27 bulb (not included). The light is LED compatible, make it low energy by selecting energy saving LED lamp options. The Princess Radiance has a pull chain fan control and is remote control and wall adaptable. Remote and wall controls sold separately. 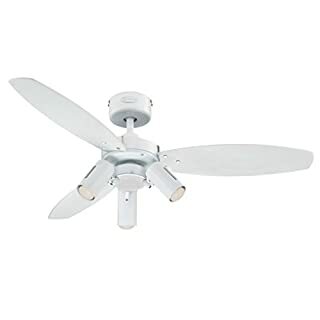 For year-round comfort and maximum energy savings, this Westinghouse ceiling fan includes a reversible switch that allows the ceiling fan to be used during cool or warm weather. 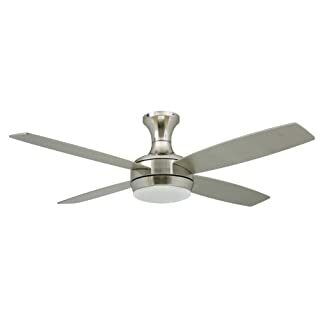 In the summer, keep your home cool by running your ceiling fan counter clockwise. 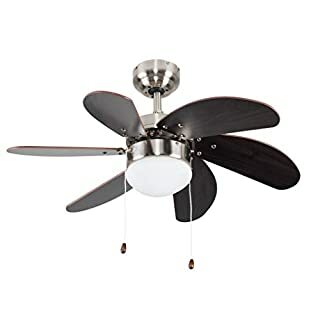 In the winter, run your ceiling fan clockwise to re-circulate warm air from the ceiling, eliminating cold spots and cold drafts.These versatile ceiling fans may be installed with or without the extension down rods included in the packaging. This flexibility allows you to install the fan either close to the ceiling or at a lower level in rooms with higher ceilings. 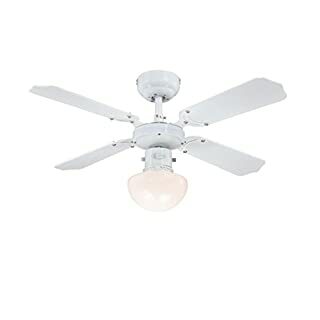 The height of this fan, as noted in the specifications tab, is the rod mounted height. 10cm can be deducted from the height if you choose to not use the supplied extension rod. The Dual mount system also allows you to use the longer extension rods which are located in the spares and accessories tab. 12" and 18" extension rods are recommend for rooms with 9' ceiling and higher. 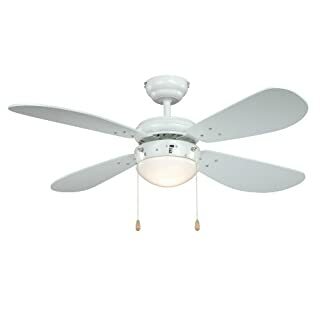 The Vegas ceiling fan from Westinghouse (72185) has reversible white and washed pine blades with a white fan finish. Each blade supplied can be flipped over to show the colour of your choice. This fitting requires 1 x 60w E27 bulb (not included). 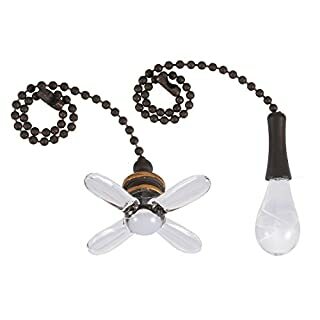 The Vegas ceiling fan has a pull chain switch and can be fitted with optional remote or wall control adapters. Reversible for summer/winter operation. Only up to 65 watt power consumption.Diameter 132 cm.Housing colour: matt nickel.3 fins, dark walnut colour.Includes remote control. 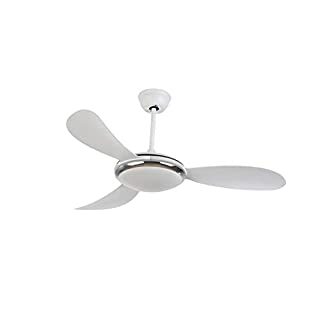 Princess Trio (42", 105 cm) ceiling fan from Westinghouse has reversible oak cane and white blades, each blade supplied can be flipped over to show the colour of your choice. The light fixture has 3 frosted glass shades, and white fan finish. The light fitting requires 3 x 60w E24 (SES, small screw) light bulbs. Reversible for summer/winter operation. 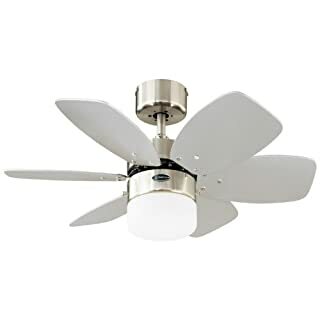 The satin chrome Flora Royal ceiling fan from Westinghouse (78788) has a diameter of 30" (76cm) with reversible blades that can be fitted to show either silver or white finishes. Each blade supplied can be flipped over to show the colour of your choice. The light fixture requires 1 x 60w E27 bulbs (not included). 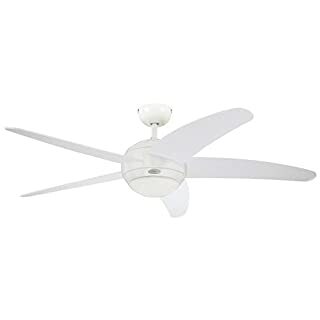 These versatile ceiling fans have a dual mount system which allows them to be installed with or without the extension rod included in the packaging. Reversible for summer/winter operation. Industrial retro metal rotatable ceiling light shade handily install and easily keep clean - which is a swift and economic way to update your room in seconds! Product Features: Shade Material: Metal Color: Copper Shape: Pomelo Dimension: 27*27*13 cm / 10.6*10.6*13 inches Base Diameter: 14cm / 5.5 inches Occassion: for Indoor Pendant Lighting like cafe or inn Bulb Information Bulb Type: LED/Incandescent/Fluorescent Bulb Base: E26/E27 Wattage Per Bulb: Max 60w Number of Light: 3 More Tips: 1. 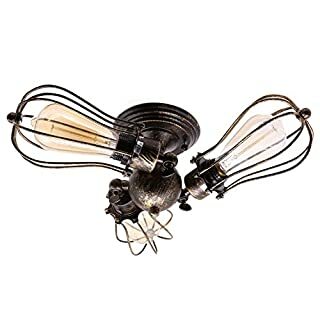 This listing is for the pedant light shade sales only, you could achieve more wonderful decorative effect by choosing more styles and DIY your own combination. 2. Note: No bulb is included in your order. You may use any E26/E27 bulb to meet your various needs, such as Edison bulb for decorating, led bulb for energy saving. 3. Please allow a little size deviation for manual measurement and some sort of difference in color tone shown on monitors with distinct contrast and screen resolution settings. Package Including: 1x Ceiling Light Shade without Bulb Return Policy We guarantee that any defective products you've received within 30 days will deserve a full refund or a quality replacement depending on your choice. For further questions, please feel free to contact us and we will guarantee you a satisfactory solution within 24 hours. Thanks for your understanding. MOTENT MOTENT, a growing trading company, mainly focuses on selling high quality light fixtures and accessories for Pendant Lights, Spot Lights, Wall Lights and more other products. Retailing business, small orders or large orders are totally acceptable. We highly value your support and satisfaction by constantly improving our products and services, to be our customers' better choice.